Image caption Mr Kalanick said his decision to join Mr Trump's economic advisory group was "misinterpreted"
Travis Kalanick, the chief executive of ride-sharing service Uber, has stepped down from President Donald Trump's economic advisory group after strong criticism from staff and the public. The board, which also counts Tesla chief executive Elon Musk as a member, is due to meet the president on Friday. Uber is one of several technology firms concerned over the impact of the immigration ban on its workforce. The company said it had set up a $3m legal fund to help those affected. These may include Uber's own drivers. However, Elon Musk tweeted that he would attend Friday's meeting. "Advisory councils simply provide advice and attending does not mean that I agree with actions by the Administration," he said. "I and others will express our objections to the recent executive order on immigration and offer suggestions for changes to the policy." Other companies involved in the panel include IBM and General Motors. For his part, Mr Kalanick had informed his employees earlier on Thursday about his decision. In a memo to staff seen by the BBC he said: "Joining the group was not meant to be an endorsement of the president or his agenda but unfortunately it has been misinterpreted to be exactly that. "Earlier today I spoke briefly with the president about the immigration executive order and its issues for our community," he wrote. 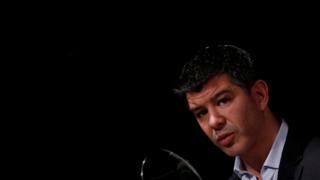 Appearing frustrated with how his involvement was being interpreted in the press, Mr Kalanick added: "The implicit assumption that Uber (or I) was somehow endorsing the Administration's agenda has created a perception-reality gap between who people think we are, and who we actually are." The move was backed by the Independent Drivers Guild which represents Uber drivers in New York. "This is an important show of solidarity with the immigrant drivers who helped build Uber and number over 40,000 in New York City alone," said the group's founder, Jim Conigliaro. Uber has come in for some heavy criticism since President Trump's election. Over last weekend, as protesters gathered at several US airports, Uber appeared to defy a taxi strike by removing surge pricing - the mechanism by which prices go up on the service when demand is high. A social media campaign to "#DeleteUber" quickly went viral. However, Uber said it had not been its intention to break the strike, and was looking to help people reach the airport without paying higher fares. Follow Dave Lee on Twitter @DaveLeeBBC and on Facebook. Why are Trump opponents deleting their Uber accounts?